This is the first of a series of articles I wrote for DNA in April on why I believed Flipkart (India's largest online retailer and among the most highly valued startups in the world) was at losing focus, at the wrong time, when faced with its most serious competition to date. 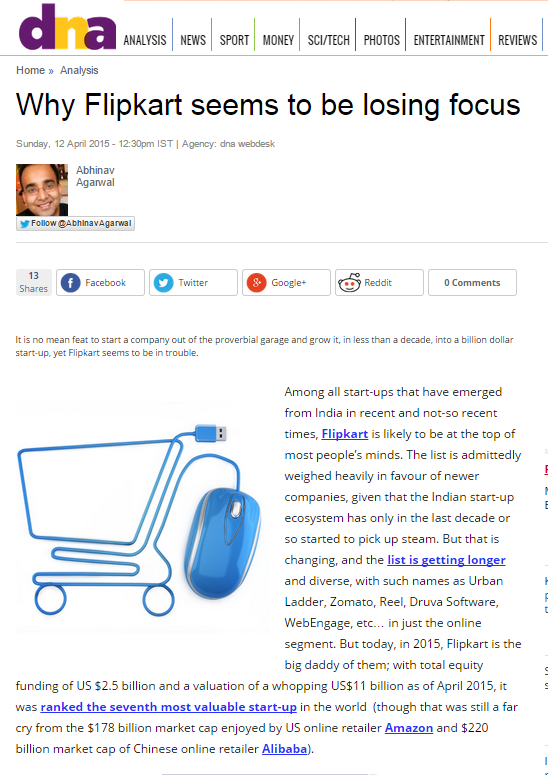 "Why Flipkart seems to be losing focus", appeared in DNA on Sunday, April 12, 2015. Among all start-ups that have emerged from India in recent and not-so recent times, Flipkart is likely to be at the top of most people’s minds. The list is admittedly weighted heavily in favour of newer companies, given that the Indian start-up ecosystem has only in the last decade or so started to pick up steam. But that is changing, and the list is getting longer and diverse, with such names as Urban Ladder, Zomato, Reel, Druva Software, WebEngage, etc… in just the online segment. But today, in 2015, Flipkart is the big daddy of them; with total equity funding of US $2.5 billion and a valuation of a whopping US$11 billion as of April 2015, it was ranked the seventh most valuable start-up in the world (though that was still a far cry from the $178 billion market cap enjoyed by US online retailer Amazon and $220 billion market cap of Chinese online retailer Alibaba). Yet Flipkart seems to be in trouble.